Artist Daniel A. Moore has been documenting great moments in sports on canvas since 1979 when he released his first limited edition fine art print entitled The Goal Line Stand. The painting commemorated Alabama's great defensive stand against Penn State in the Sugar Bowl to clinch the 1978 National Championship. 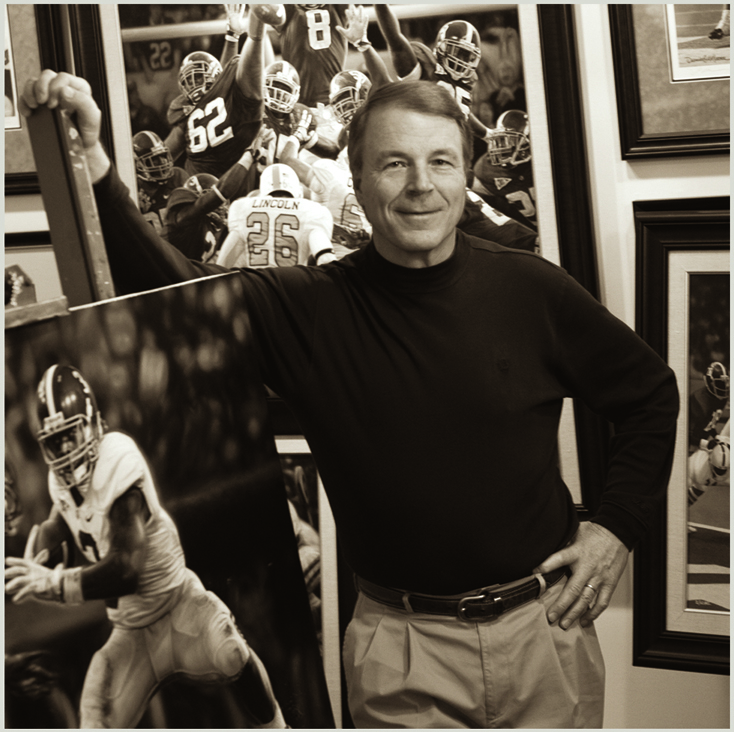 Moore has been commissioned to create paintings for the SEC, MLB, NFL, NBA, USGA, PGA, the Sugar Bowl, the Outback Bowl, the Citrus Bowl and the Liberty Bowl, as well as numerous universities. His original works are proudly owned and displayed by museums, corporations, and private collections and his artwork is familiar to millions of people across the nation. In addition, his talents were sought after by the United States Postal Service, commissioning him to create the paintings for the 1997 "Legendary Football Coaches" commemorative stamp series which featured Vince Lombardi, "Bear" Bryant, George Halas and "Pop" Warner. Mr. Moore received the prestigious international honor of being named 2005 Sport Artist of the Year by the United States Sports Academy. Some of the College Football Game of the Year® original artwork proudly hangs in his gallery, New Life Art, in Birmingham, Alabama. New Life Art, Inc. is the exclusive publisher of Fine Art Editions of Daniel A. Moore artwork.